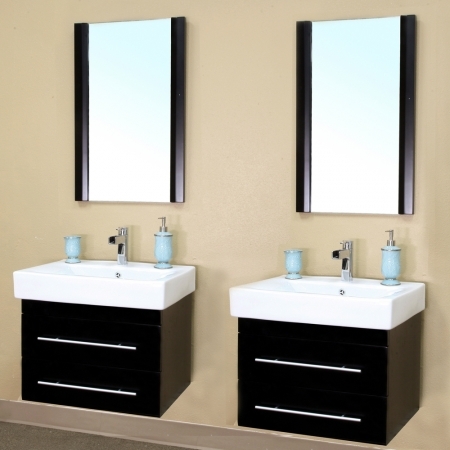 Replacing a standard double vanity with two floating sink and cabinet sets creates an open look that seems to expand the space along your bathroom wall. 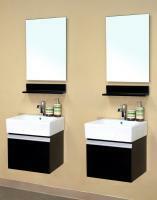 The dark hardwood cabinets are offset by white ceramic sinks and nickel accents, providing a simple and striking ensemble for your bathroom. Mirrors available for purchase 19.7"W X 2"D X 31.5"H.
Additional Sizes: Also available in 24 Inch Single Sink Bath Vanity, 48 Inch Double Sink Bath Vanity. 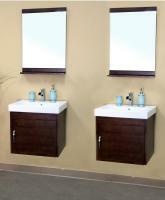 Material: This bath vanity is constructed of solid Birch wood. Birch is a tree that is found all over the country and can be recognized by its white bark. It is similar to the Aspen species. Birch lumber for solid stock is a smooth tight grained wood, usually light with a hint of red in its natural color. It’s very smooth and is a great choice for cabinet building, both painted and stained. All hardwoods have been Kiln dried to ensure a stable product that will not expand, contract, or warp.